Despite market challenges, the latest U.S. Department of Agriculture (USDA) trade data show exports of U.S. distiller’s dried grains with solubles (DDGS) have remained steady due to attractive prices, available supply and market development efforts by the U.S. Grains Council (USGC) among a diversity of buyers. From September 2016 to March 2017, USDA reported the United States exported 6.9 million metric tons of DDGS, a 6 percent increase year-over-year. This steady pace of exports occurred even with a dramatic drop in purchases from the largest player in the past few marketing years, China. In January 2017, the Chinese government started enforcing anti-dumping and countervailing duties on U.S. DDGS, leading to a 69 percent decrease in DDGS exports to China from 2015/2016’s sales of 1.9 million tons. USGC played a key role in the U.S. ethanol and DDGS industry’s defense against these investigations by China. While this void had an enormous impact on the DDGS market and U.S. DDGS producers, it left ample supply for other world buyers to purchase at prices below corn. While this trend is not uncommon historically, the spread between the two is now the longest it has been in the last five years. USGC programs throughout the world are helping end-users determine how best to incorporate U.S. DDGS into their rations and seeing results in new areas of demand. Mexico was the second largest market for U.S. DDGS in 2015/2016, purchasing 16 percent of all U.S. exports, thanks to geographic advantages and preferential trade terms in the North American Free Trade Agreement (NAFTA). In the first six months of 2016/2017, Mexico’s imports are up 12 percent year-over-year at 1.2 million tons. DDGS-focused work there has focused on educating buyers, increasing purchases by existing customers and promoting an expansion of sales into new markets like in the southeast of the country through dairy and livestock feeding trials. 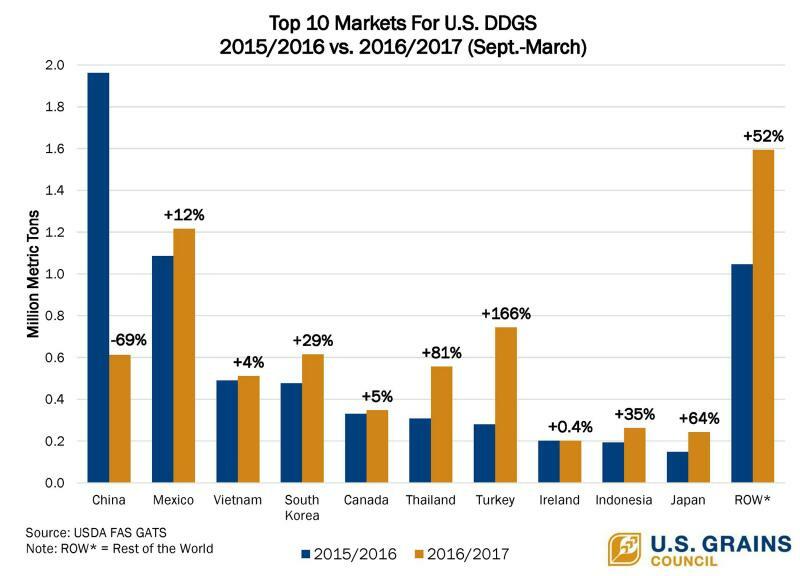 USGC activities, like a recent DDGS promotion conference, are also helping increase DDGS purchases by South Korea. Purchases in the first half of 2016/2017 have increased by 137,000 tons year-over-year with a total of more than 615,000 tons. These purchases are also supported by preferential trading terms under the U.S.-Korea Free Trade Agreement (KORUS). In May, USGC representatives in the Middle East learned Saudi Arabian buyers entered aggressively into the DDGS market, making several large purchases, a direct result of USGC’s promotion efforts in this region. Other markets are also looking closely at the product. Turkey has steadily increased imports of U.S. DDGS in recent years, but exports in the first half of 2016/2017 have more than doubled year-over-year to nearly 744,000 tons. Exports of U.S. DDGS to Thailand, which have also grown over time, saw a significant jump of nearly 249,000 tons so far in 2016/2017 compared to the same period the year prior, for a total of more than 556,000 tons. Notable increases have also occurred in New Zealand, Egypt and Peru. USDA estimates currently project U.S. DDGS exports will reach 11 million tons by the end of the marketing year in August, around the five-year average of 10.2 million tons. If the aggressive purchases of world buyers continue throughout the second half of the marketing year, the final numbers could exceed this prediction.